Two watermelon dresses, with white sashes, and white shoes. 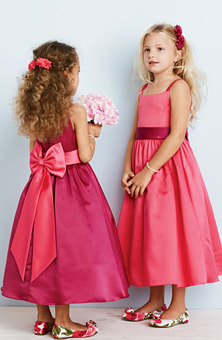 Well the flower girls went and tried on their dresses. Both were super excited. Ella got to try on the exact color scheme since that was what DB had in her size. Elaina has on a green dress with blue sash so she got to see the style and was super excited the color is named watermelon. Ironically both moms were on the hunt for cute shoes and both ended up with very similar styles. These girls are going to be so adorable! I made my own since I was not in love with some of the flower girl baskets I had seen. 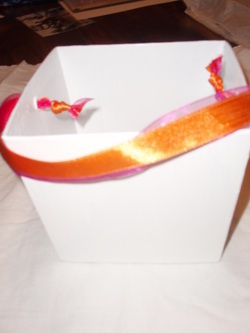 Check out the DIY for instructions - this was fairly simple, and while I got mixed reviews I do like it and am keeping this as the flower girl baskets. They are empty now and the picture is not all that great but they will work for the look I am going for. What they are most excited about - the GIFTS! So here is the flower girl's loot! 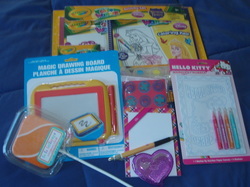 I got them a big color wonder Crayola set, a small magic doodle, a Hello Kitty marker set, compact with a comb, tic tac toe wooden game, note pad with their name and a pen) and a giant sucker. I am actually planning on splitting this up between the rehearsal dinner and while we are getting ready. The plan is the quiet cleaner things they will get as a present while we are getting ready so they can bring it to the church if ADD sets in or they get antsy.